Tolkien fans rejoice! 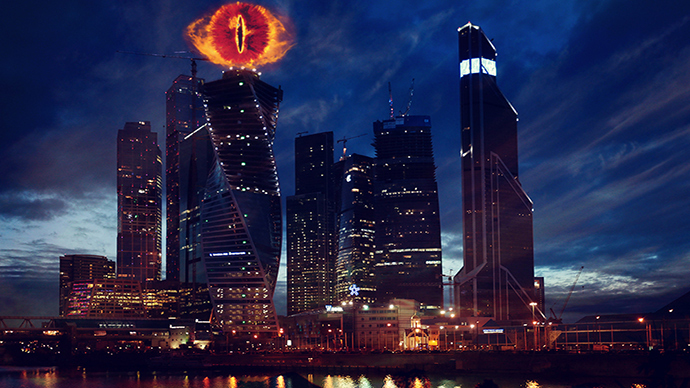 The ‘Eye of Sauron’ now is not just fiction – it will light up the skyline of Moscow-City to ominously watch down on the Russian capital as the latest “Hobbit” movie premiers in Russia on Thursday night. Fans of the British fiction novelist J. R. R. Tolkien will re-create the Eye of the Dark Lord Sauron from the “Lord of the Rings” trilogy on Wednesday night, according to The Hollywood Reporter Russia. The creators from a Russian art-group ‘Svechenie’ dreamed up this wild installation as a tribute to the great saga and its film adaptation. They said that the installation of a real life Eye of the Dark Lord of Mordor will “let millions of fans visit Middle-earth” – the fictional world where the adventures of the trilogy take place. The light installation of the perilous Eye engulfed in flames will be set up on the roof of the “IQ-quarter” complex at the Gals-development company in Moscow International Business Center "Moscow-City". In Tolkien’s saga the lidless Eye was the symbol of power and fear though which the Dark Lord Sauron was able to exert his will over Middle-earth. It was stationed atop the Barad-dûr tower – the fortress from which Sauron watched over the world. The All Seeing Eye is an allusion to mass surveillance and control. The epic fantasy adventure films based on Tolkien’s novel were directed by Peter Jackson. The first part of the trilogy - The Fellowship of the Ring - was released in 2001. Following the global success Jackson filmed Tolkien’s prequel novel “The Hobbit. Or There and Back Again.” The movie series features three parts, the last of which was released in December.